Earlier this month, I hinted at a secret deck. It was just Chimecho in Psychic Malamar. I tried to keep the tech a secret, but a lot of people just started figuring it out on their own. Knowing this, I wanted to find a way to improve my deck's matchup against other Malamar decks that might...play...Chimecho. I ultimately settled on Oricorio...as I found it increased my odds of attacking with Deoxys turn 2 from about 50% to 70%. -1 Necrozma-GX, +1 Chimecho. 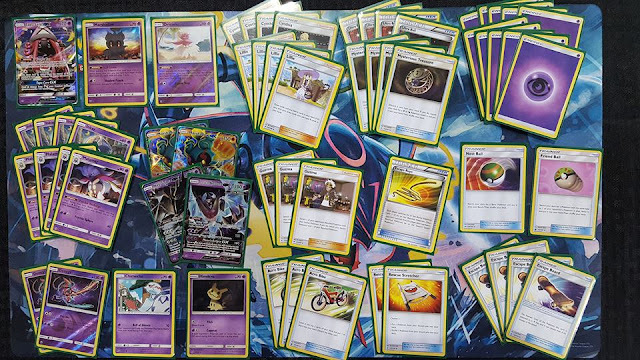 Chimecho helps the Zoroark-GX matchup and one [fewer] Necrozma-GX helps the Shrine and [mirror] matchups. -1 Acro Bike, +1 Oricorio GRI 55. Oricorio serves a similar function to Acro Bike, and improves your Shrine and...mirror matchups considerably. It is basically a dead card against [decks that play] Sudowoodo, though. -1 Friend Ball, +1 Nest Ball. Nest Ball is a lot better vs. ZoroRoc, plus helps you get turn 1 Chimecho lock more consistently. I still don't feel comfortable running two Nest Ball due to late game concerns though. -1 Guzma, +1 Escape Rope. ...I wanted an out to mill decks. I ended up cutting Guzma...as I found it was clunky to draw into [in the] early game. This hurt me a few games, but Escape Rope also helped me a few games. I think I would go back to fourth Guzma if I did not expect mill. And no, I would not cut fourth Escape Board...don't even ask." I am finding myself warming up to Lunala ♢ after Gustavo [Wada's] performance and personally losing twice to BuzzRoc. Thanks for sharing this article.I’d choose to make use of some with the content on my blog whether or not you don’t mind. Thanks for sharing such a nice article.This type of message always inspiring and I prefer to read quality content.Those are what I want to know.I'm thankful if you can upload more posts later. Nice post. I study one thing tougher on completely different blogs everyday. I want to see more work that is similar to this. Hello! This is kind of off topic but I need some advice from an established blog. Is it very difficult to set up your own blog? I’m not very techincal but I can figure things out pretty quick. I’m thinking about making my own but I’m not sure where to begin. Do you have any tips or suggestions? Thank you. I am regular visitor, how are you everybody?